So, even though the book was a tad bit messy (plot and sub-plot wise) in places it was definitely an enjoyable, psychological read for me. It was a book where I could sit and try to guess and guess and ultimately still be wrong about what was going to happen on the next page. 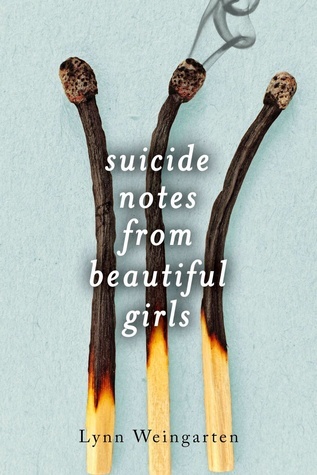 I really enjoyed how Suicide Notes from Beautiful Girls was told in alternating past and present tenses as well as alternating points of view (that you soon find out). I enjoyed it because the story is never quite what you imagine it to be. Is it REALLY a murder? Is it REALLY a suicide? Is it a story of a co-dependent friendship gone insanely terrible? Is it a high school drama? What is really going on here? With every page, I grew more and more unsure of what was actually going to happen yet I grew surer it was not going to be what I expected so that was insanely fun! I haven’t read a book like it in, well, ever I don’t think. This book is definitely one of a kind! The plot gets a little crazy and messy at times but I enjoyed it nevertheless, and the ending had me like WHAT?! This fast-paced read is emotionally haunting and the writing is done in such a way that I felt June’s feelings. At points, I felt I couldn’t trust a single character, and for me that’s awesome because unreliable characters are my absolute favorite. I would recommend this book to any one who likes to read books about people that are not who they seem. Their mystery a fun and enjoyable ride for all!